The ranking at the link above was generated using the Lee Sinins Complete Baseball encyclopedia. It includes all pitchers from 1920-2006 with 2000+ IP. There were 277 pitchers. REL BB means relative walks. For Eppa Rixey below, the 1.455 means that the average pitcher walked 45.5% more batters per 9 IP than he did in his career (2.78 vs. 1.91). REL HR means relative HRs. The 2.013 for Rixey means that average pitcher allowed 101.3% more HRs than he did (155 vs. 77). If a pitcher has a number below 1, he was worse than the average pitcher. HR*BB is just the previous 2 multiplied by each other. Greg Maddux ranks very high. Only Rixey is ahead of him. But he pitched almost all of his post 1920 time with the Reds (1920 with Philadelphia and 1921-33 with the Reds). Their park was extremely difficult to hit HRs in. From 1920-29, it allowed only 22% as many HRs as the average park in the NL! (that is according to the STATS, INC. All-Time BASEBALL SOURCEBOOK) That helps explain why Rixey does so well. The only other pitcher besides Maddux to have a score of 1.50 or more for both HRs and BBs is Pete Donohue. But Donohue also spent almost all of his career (which lasted from 1921-32) with the Reds. So, for all practical purposes, Maddux is the only pitcher to best the league average by at least 50% in both HRs and BBs! I think it is amazing that a guy who put the ball in the strike zone so much would give up so few HRs. Maddux allowed 318 HRs while the average guy allowed 483 (483/318 = 1.519). He walked 1.84 per 9 IP while the average walked 3.34 (so 3.34/1.84 = 1.815). Last week I found the all-time leaders in HRs per time making contact. 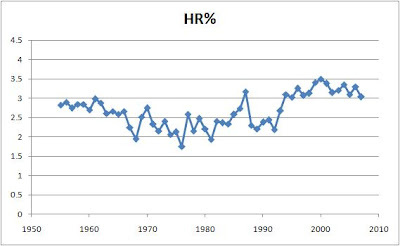 This week I look at the overall rate in MLB since 1955 for non-pitchers only. Times making contact is AB - K + SF. The first graph below shows this rate. Then then next one shows HRs per AB (HR%) and then the next one shows HRs per plate appearance with PA = AB + non-intentional walks + SF + HBP. The last graph shows strikeouts per AB. I don't show strikeouts per PA since that mimics strikeouts per AB very well. 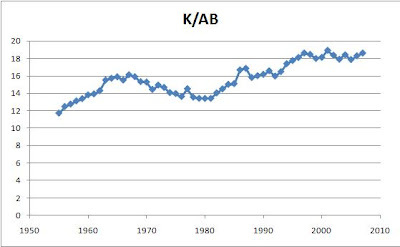 HRs per AB hit a low of 1.75 per 100 ABs in 1976 and reached a high of 3 in 2000. So the absolute gain from 1976 to 2000 was 1.75 and the ratio of the later rate to the earlier rate was 2. 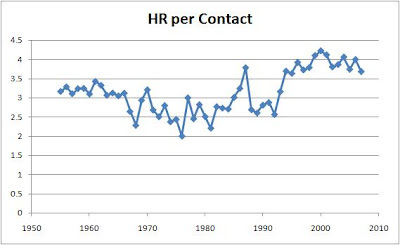 HRs per time making contact a low of 2 per 100 times making contact in 1976 and reached a high of 4.22 in 2000. So the absolute gain from 1976 to 2000 was 2.22 and the ratio of the later rate to the earlier rate was 2.11. 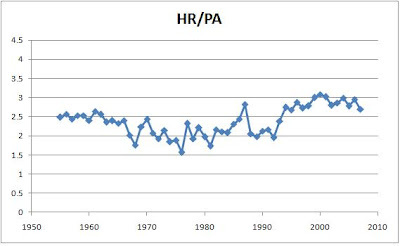 HRs per PA hit a low of 1.57 per 100 PAs in 1976 and reached a high of 3.08 in 2000. So the absolute gain from 1976 to 2000 was 1.51 and the ratio of the later rate to the earlier rate was 1.96. Why would the HR per contact rate rise more than the either of the other two rates in both absolute and relative terms? One thing comes to mind is that players are swinging more for HRs, which would raise their K total but that hard swinging would lead to more HRs when they do make contact. Maybe it was steroids or smaller parks or a livelier ball, but those would raise the HR per AB rate, too but why would those things raise the HR per contact rate even more? 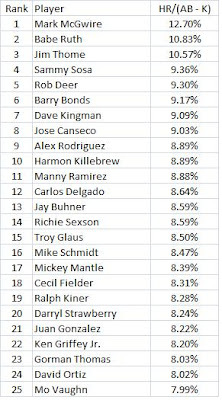 I found the top HR hitters by dividing their HRs by the times they made contact (that is, at-bats minus strikeouts). They may have made contact a few other times with sacrifice flies and sacrifice hits, but SFs have not always been kept separate from sacrifice bunts. The players included everyone who had 4,100+ plate appearances from 1920-2007. My source was the Lee Sinins Complete Baseball Encyclopedia. The first table shows the leaders. The second one has their rate divided by the league average. I am not sure if this proves anything, but it was fun to compile and see who the leaders were. In the first table below, McGwire is the leader and is a good bit ahead of the 2nd place Ruth. After McGwire, the players are pretty bunched up. McGwire hit 583 HRs in 6,187 ABs. He struckout 1,596 times. That gives him 4,591 contact ABs. Then 583/4,591 = .127 or a 12.7% HR-per-contact rate. In the table below, Ruth had a rate of 10.8% while the league average was 1.4%. Since 10.8/1.4 is about 7.69, he gets that as his "relative rate."